Firstly thankyou to HQ for sending me this, it wasn't expected and i was so excited. I love a crime book. Especially when it is one that comes with its own newspaper. Turn A Blind Eye is the first in the Di Maya Rahman series and it was a great start. When a headmistress is found murdered in her office on the first teacher training day of the term, it sparks up a major investigation. Found alongside her is a Buddish Precept but thats the only clue as to why and who murdered her. Di Maya Rahman is hoping that this is a one off but when a second body turns up and its one that is in relation to the first, this one off seems less likely. Time is running out because what if it happens again? Di Maya Rahman needs to find answers, but answers are hard to come by when its a closed community who guard their secrets. It makes it a heck of alot harder. 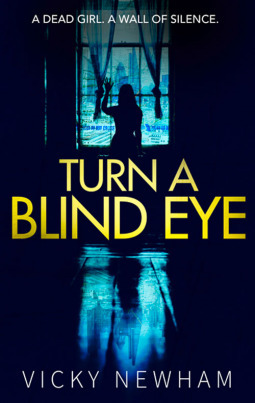 Turn A Blind Eye was a very interesting read, and to me it wasn't the plot line that gripped me as such it was the relationships between the characters and the cultures. It was those i was interested in. They were all written so well, and every night i had to sit down and delve into this more. I enjoyed it slowly and I can see why it has been labeled "Your New Obsession" especially with the TV Rights already sold. I don't want to give too much of the narrative away, but what I will say - if you love a crime series and are on the lookout for a new one, this could be the one for you. I was so invested in learning about every character that I came across that I forgot they wasn't real. I cannot wait for more! Vicky Newham is a writer, psychologist and teacher. She is the author of the DI Maya Rahman series of police procedural novels set in multi-cultural East London. The first, TURN A BLIND EYE, will be published on April 5th 2018. It has been optioned for TV by Playground Entertainment. The setting of the novels, and its main character, were inspired by the 4 years that Vicky spent living and working in the area. Vicky grew up in Sussex and currently lives in Kent. She studied Psychology at university and is still fascinated by what makes people tick.